Brett King, our most sought-after banking expert and speaker, and founder of the Movenbank spoke at Sberbank IT Session at Frankfurt EURO FINANCE WEEK 2012. 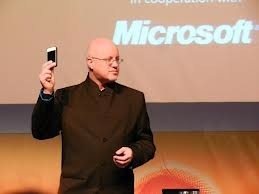 Here is the video: Contact us at Speakers Connect at [email protected] or +852 21654126 if you would like to engage Brett for your next event, or viist us for more top-notch International Speakers from us. Brett King , author of Bank 2.0, and the newly released Bank 3.0, is the biggest supporter of mobile banking – and that banking at the branch is out… Here is the video of his recent speech at Next Bank Europe : Contact us at Speakers Connect at [email protected] or +852 21654126 if you would like to engage Brett for your next event, or viist us for more top-notch International Speakers from us . Brett King , best-selling author of BANK 2.0, a renowned public speaker and advisor to some of the world’s biggest financial services organizations and leading brands, provides the keynote address for the ACI Community Financial Confernece 2012, addressing “The Big Shift.” … Here to challenge your thinking and prepare you to address the next chapter in banking for your financial institution, Brett’s session explains: · Why customer behavior is so rapidly changing, including the four phases of disruptive change; · How community financial institutions and their branches must evolve; · Why checks are rapidly disappearing and cash is next; · Why your mobile phone will replace your wallet in the next 2-3 years; and · How financial institutions must reinvent themselves or become irrelevant.